On-demand, instantaneous, or tankless water heaters have been popular in recent years, promising a better alternative to their traditional counterpart. It is an essential addition to many homes, especially if taking a shower is always a struggle for you. They are compact and energy-efficient, which are just some of the reasons why you might want to consider having one. This section is divided into two parts. The first part will be my recommendations for an electric tankless water heater. The next part, on the other hand, is for those that are gas-powered. To summarize what you can expect in each product, refer to the table below. If you live in a place where the temperature can drop to as much as 40 degrees Fahrenheit, this is an ideal water heater for you. It has a heating capacity of four gallons per minute. Given such, it will be able to heat two showers at a time. It can also be used for heating up to four sinks while making sure that the water temperature remains hot. Among its innovative features, one worth noting is the Self-Modulating Technology. The latter allows the unit to become more energy-efficient without having to compromise its heating performance. With the latter, you will enjoy as much as 30% savings in your electricity bill compared to the use of a traditional heater. To make it easier for you to monitor the temperature of water, there is a digital temperature display. As the owner, you will have complete control over how it is used. You will be able to control the temperature an increment of one degree. Another thing that makes this an impressive product is the presence of internal jumpers. The latter will be effective in limiting the heat output of the water heater to a maximum of 105 degrees Fahrenheit. With this, you can be confident that the water output will not be heated beyond the maximum. The materials used are also reflective of top-notch quality. For instance, brass tops are used for the prevention of electrolysis. There is also a copper heat exchanger. If you want to have peace of mind, there is no need for you to be worried. The manufacturer offers a lifetime warranty on its parts. This means that if you need to have it repaired, you can bring it to authorized service providers and they will provide replacement parts for free. The labor, on the other hand, is not included in the warranty coverage. 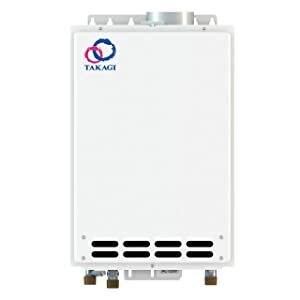 From its durability to its lifetime warranty, this is a tankless water heater that you should purchase if you want a product that delivers superior functionality and reliability. This is the perfect choice if you live in a studio apartment. Given its size and power ratings, this is ideal only for heating shower in a single bathroom. If you have a large household, this will not suffice. The water heater is not only stylish, but also compact. If you have space limitations, there should be no problem as it has a sleek design. 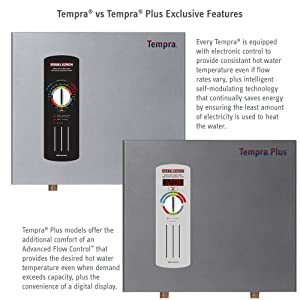 One thing that is well-loved in this product is the digital temperature control, providing users with the opportunity to set the heat level based on what they are most comfortable with. That being said, you can set the heat from 80 to 140 degrees Fahrenheit at an increment of 1-degree Fahrenheit. There is also a digital display that makes it easy to monitor the temperature of water. When it comes to durability, you will also be impressed by this product. The manufacturer used premium materials that can withstand the test of time. The heat exchanger, for instance, is made from robust brass and copper. They are also threaded, which will make replacement a snap to accomplish. If you are concerned about the consumption of electricity, it is also worth pointing out that it is 99.8% energy-efficient. It draws 54 amps of power, which some might find quite high, but this is typical of a water heater. To prevent problems in your electrical system, you need to make sure that there is a 60-amp breaker box that can handle the power requirements of the heater. Lastly, the manufacturer is offering a three-year warranty on its parts. Coupled with the fact that the heater is made in Germany, you can be confident that it will deliver superior performance even through the years. 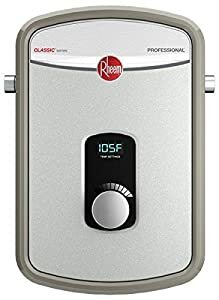 Buy this tankless water heater if you are looking for one that is to be used in a single bathroom, especially if you want one that is space-efficient. The first thing that most of you will notice about this product is its price, especially given the fact that this is an electric model. In fact, from the three electric tankless water heaters that are mentioned in this guide, this is the most expensive. Nonetheless, once you take a look at its features and technical specifications, you will realize that the price is worth it. As the manufacturer claims, this is the most technologically-advanced from the competitive landscape. One of the reasons for this is the Advanced Flow Control, an innovation that has been developed exclusively by the company. The latter provides automatic adjustments in the flow of water so that you will not experience temperature fluctuations. This tankless water heater is made in Germany, which can also provide you with the assurance that the quality is second to none. The manufacturer used upgraded electronics that can withstand wear, providing an assurance that it will be long-lasting. When it comes to installation, you will have another good reason to love this product. The manufacturer provides comprehensive instructions that will be easy for you to follow. Plus, the best thing is that there is no more need for venting. It also comes with a sleek design. Even if the bathroom is small, it won’t eat up too much space. Nonetheless, despite being compact, its performance is impressive. Another thing that makes this a commendable choice is the fact that it operates without making any noise. It heats your water while operating silently. To be able to save energy, there is an auto modulation feature. This ensures that the least amount of energy will be used in the absence of having negative impacts on the heating capability of the unit. This is the heater that you should purchase if the price is not an issue. Yes, it is expensive, but the cost can be justified by its performance and quality. At this point, we will move to the products that are highly-recommended if you need a heater that is gas-powered. The power of this water heater is one thing that can convince you to choose it above many others. It has a flow rate of 9.5 GPM. It does not require a lot of time before it can supply you with hot water, either in the shower or sink. Even if you use it in a place that is at high altitude, you can be confident that its heating capabilities will still be superior. To be specific, you can use the heater at an altitude of up to 9,840 feet above sea level. Another feature that makes it one of the favorites within the product category is the digital display. The latter does not only show the current temperature of the water that flows out, but it also shows diagnostic codes. This makes it easy for you to spot any problem and troubleshoot it before it becomes worse. There is a reliable self-diagnostic system that makes repair and maintenance a snap. You can also use it with EZ-Link cable, although the latter needs to be purchased separately. This is going to be useful if you need to connect two units, which will enable better heating performance. To make it long-lasting, there is a freeze protection of up to -30 degrees Fahrenheit. However, there are some negative feedbacks with regards to its durability, which makes it more important to execute proper care and maintenance for its longevity. Lastly, it should also be noted that the manufacturer is offering an attractive warranty coverage. For the parts, the warranty is only one year, which is quite the standard. What is impressive is the warranty on the heat exchanger, which lasts for ten years. 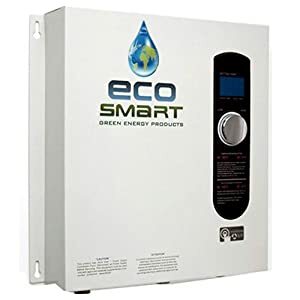 Buy this gas tankless water heater if you do not mind the price. This is expensive, but it is highly-effective, even if you live in a large household. With 140,000 BTU and a maximum flow rate of 6.6 GPM, this is another option that should be included in your list of choices. Although it is powerful, however, it should be noted that you should limit its use indoors as specified by the manufacturer. If you live in a place with a warm climate, it is capable of heating up to two showers at a time. However, if you live in a place where it is cold, it can heat only one shower. Its heating capacity will be dependent on the ground water temperature. When it comes to installation, you can expect versatility from this product basically because it can be assembled at both horizontal or vertical orientation. To complete its installation, however, you will need 4-inch Category III stainless steel, which will be required for venting. With Energy-Star Certification, you can expect that it is going to heat your water without using too much energy. Based on its technical specifications, it has an energy factor of .81 to .83. This gas water heater does not also run short in terms of safety features. For instance, it has built-in freeze protection, which will be useful if you live in a place with chilly temperature. There is also a flame sensor and an overheat cut-off fuse. That being said, using this product will cut down possible safety risks. If you are still finding it hard to be convinced that this is an excellent product, you should learn about its warranty. The heat exchanger is covered for 10 years while all other parts are covered for 5 years. Nonetheless, keep in mind that for the warranty to be valid, installation should be done only by a licensed technician. Buy this gas water heater if you have a small to medium home. It is more affordable compared to most of its competing models, plus, it has an extensive warranty. In terms of popularity, it cannot match those that are made by well-known brands. Nonetheless, if you look beyond the brand name, you will find a lot of reasons to love this product, especially the fact that it is powerful, despite having a sleek profile. This water heater is rated 140,000 BTU per hour. That being said, this will be more than enough for a small to medium-sized home. Its performance is comparable to what you can expect from a 40-gallon tank water heater. The LCD display control is also a good feature that you will find in this product. The latter makes it easy to monitor the functionality of the unit, especially its temperature. To add, you can also input the temperature as desired to be assured that the heat will be in accordance with what you want. The modulating technology is also an innovative feature that is impressive. With the latter, there are automatic adjustments that are made by the unit, making it intelligent and allowing users to save energy in the long run. The heat output is changed in an instant when there is a change in the water flow rate. The pure copper heat exchanger is one of the reasons why you can expect longevity from this product. The material that is used makes it comparable to those that you can find at the higher end of the market. The heat exchanger is covered up to 15 years, which is one of the longest that you can find from the product category. To be eligible, the name on the invoice should be the same as the name of the owner at the time a repair is requested or a problem is reported. Buy this tankless water heater if you do not care about the brand. It is not as popular as the others mentioned in this guide, but its performance is worth commending. 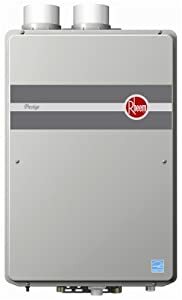 This gas-powered tankless water heater has a maximum BTU of 150,000 flow rate of 6.6 GPM, and energy factor of .82. It has Energy-Star certification, which is a proof that it uses minimal energy when heating. If your house has two bathrooms, this will be more than sufficient to provide your heating needs. The unit comes with a leak detection feature, which is one thing that can help in its longevity. When a leak is detected, the power is automatically turned off, which will prevent damage to the internal components of the unit. It also comes with enhanced scale detection, which is another feature that can be attributed for its durability. This will lessen the likelihood that the unit will suffer from serious damages. There is also an error code indicator that is incorporated in this water heater. This will make diagnostics a snap to accomplish, even on your own. The code will let you know in an instant what the problem is. As much as possible, however, avoid doing major repairs on your own as this can void the warranty of the product. Meanwhile, to make sure that the heat will remain the same level throughout its use, it comes with an innovative temperature lock, which has the primary function of preventing unauthorized or accidental fluctuations in water temperature. One thing that you will notice about this model is the lack of digital display and control. 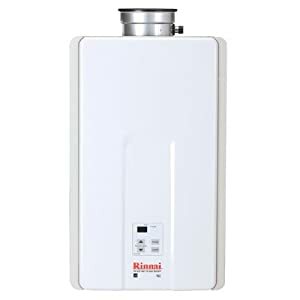 Nonetheless, you have the option to add a digital controller from Rinnai. However, you have to purchase it separately. Meanwhile, for the warranty, the heat exchanger is covered for 10 years, all other parts for 5 years, and labor for 1 year. Like in the case of the other products, be sure to read the terms and conditions specified by the manufacturer. If you want an energy-efficient and sleek gas water heater, buy this model. Nonetheless, it is not as advanced as other models since it has no digital display. What is a Tankless Water Heaters and How Does It Work? Before we proceed with the discussions on the top-rated products, let me first give you a primer on what is a tankless water heater. Demand-type or tankless water heater eliminates the need for a storage tank. Since it is an on-demand water heater, it provides heated water only when it is needed and demanded. More so, since it is also called instantaneous water heater, it means that when the unit is turned on, it heats water in an instant and eliminates the need for you to wait. In this type of water heater, heating is done directly. Once you have turned on the unit and the supply of water, cold water will pass through a pipe. As it passes, a heating element, which can either be electric or gas, will heat the water. When it comes out of the shower or the faucet, it is already heated. Why You Need a Tankless Water Heater? The best reason for you to have a tankless water heater is to enjoy an instant supply of hot water when you need it. There is no need for a tank to be filled with water and for such to be heated, which can take quite a while, depending on the size of the tank. Your comfort is another compelling reason why you should have a tankless water heater at home. Imagine taking a shower early in the morning before you go to work or late in the evening before you sleep. It will be chilly! With heated water, on the other hand, you will feel more relaxed. Energy Efficiency: As against to the water heating units with tanks, those that are tankless can save as much as 50% energy. On average, this can result in up to $100 annual savings in energy bills, but this will depend on the extent of use. It avoids wasting energy since it heats water only as needed. Compact Size: Even if you have a small space, there is no excuse to not have this kind of heater at home. They are sleek, and hence, they will not require too much space for installation. Despite their size, it is amazing how they can deliver powerful heating performance. Requires Minimal Maintenance: Compared to a tank water heater, those that are tankless will require lesser effort in terms of maintenance. It can last through the years without the need to do much on your end. In fact, most of them can last up to 20 years without heavy maintenance. No Flooding: With a tank, there is a possibility that it will rupture, especially if it is made from a material that is reflective of low quality. This can lead to flooding, which can cause damage to property and costly repairs. Fortunately, with a tankless water heater, this is not going to be a problem. Eco-Friendly: One of the ways by which it can become eco-friendly is through the reduction of energy consumption since it functions only when there is a demand. Plus, many of its parts are repairable and replaceable. Expensive Cost: Tank heaters are known for being affordable. Tankless, on the other hand, have a higher price. The initial costs, however, can be justified by the long-term savings that you will be able to enjoy. Based on estimates, the cost of a tankless water heater is up to three times more expensive. Possible Lag Times: Because water is heated only when needed, there is a possibility that it will lag. Meaning, the water that flows out of the shower head or faucet may initially start cold. Depending on the quality of the heater that you have, it might take a few seconds before the water becomes hot. Limited Output: If you live in a large house and if you use showers or faucets simultaneously, using a tankless water heater can be frustrating. This is because of the limitations in its heating capacity. Complicated Installation: In most instances, you will need a helping hand from a licensed technician, which will also prevent the warranty from being voided. You will need gas lines and venting, depending on which type of tankless water heater will be installed. Generally speaking, tankless water heaters can be categorized into two, depending on the source of their power. In the case of an electric tankless water heater, there is a flow-sensing device that controls the heating element. It needs to be connected to a supply of electricity. For safety purposes and to ensure its peak performance, this heater should have its own circuit breaker. With a flow rate of up to 11 GPM, this is a good alternative if there is no supply of natural gas, such as for those who live in rural areas. This is also more expensive compared to natural gas. If you live in the urban area where there is a supply of natural gas, this can prove to be a viable option. Compared to electric, it is more powerful, similar to how propane will perform. Electric vs Gas Tankless Water Heaters: Which One is Better? Initial Cost: Without a doubt, for most of you, the cost is one of the most important considerations in searching for the best tankless water heater. If you are on a budget, you should buy electric models as they are generally cheaper. Most of the electric models are priced at below $500. The gas heaters, on the other hand, can go as much as more than $1,000. Operating Cost: If you are thinking of the long-term cost implications of using each type of tankless water heater, you should know that gas is cheaper. Nonetheless, this does not necessarily mean that it is better. Most electric heaters have an efficiency rating of up to 98%. On the other hand, for those that are gas-powered, efficiency is only usually up to 85%. On average, it is believed that using gas as a tankless water heater can result to up to 15% more expenses. However, there are factors that will come into play, such as your location and the extent of use. Installation: For simple installation, you should go for an electric tankless water heater. They are more straightforward to assemble. With their gas counterparts, on the other hand, installation can be more complicated as there will be a need for venting and combustion air supply, among other things. There can be lots of modifications that are required. Regardless of whether it is electric or gas that you choose, it is important that you seek help from a professional when it comes to installation. This is because, in the case of some products, the warranty will be voided if the manufacturer learns that it wasn’t installed by someone who is authorized to do so. Maintenance: A well-maintained heater will deliver peak performance. Between the two, electric tankless water heaters can prove to be the better option because they will not require too much on your end when it comes to maintenance. More often than not, all that you have to do is to occasionally clean the water inlet. Meanwhile, gas tankless water heaters are more complicated in terms of their maintenance requirements. It requires annual inspection and this should be done by a trained professional. This will ensure the safe combustion of fuel, lessening the possibility that it will be a fire risk. Regular flushing is also necessary to make it less prone to the mineral deposits. Service Life: Which one lasts longer? Both of the types of tankless water heaters can last up to 20 years. However, electric heaters are easier to maintain and less prone to wear and tear, which is why they can generally last longer. They are also easier to repair and troubleshoot, which can be seen as another reason why they are usually longer-lasting. It is important to note, however, that there will be several factors that will have an impact on the service life of the water heater. Maintenance is one of these factors. If the water is hard and acidic, the heater can also be more prone to damages. Lastly, incorrect installation can also shorten its service life. Size:Before anything else, you have to determine the available space where the heater will be placed. Once it is measured, it will be easier for you to choose which one is suited for your needs. Flow Rate:Expressed as GPM or gallons per minute, this refers to the amount of water that will flow out of the shower head or the faucet in a minute. A higher number would mean that more hot water will be produced at a given time. Power:By evaluating the power, you have to analyze how quick it will be able to heat water. For electric models, look at the kilowatts. For the gas models, on the other hand, look at the BTU. If the number is higher, this means that it will be able to heat water more effectively and quicker. Durability:You also have to look at the materials that are used. See to it that they will be long-lasting. They should have a durable construction to offer the best value for money. They must be able to resist external elements, such as rust and corrosion, among other factors that could speed up wear and tear. Display: It will also be good to choose a product that comes with a digital display, which will make it easy to monitor the temperature of water. Customization: Look for a product that comes with an option to set the temperature so that you can adjust the level of heat. In many models, you can change it at an interval of at least 1-degree Fahrenheit. Safety: There are several safety features that should be present, such as protection from overheating. To add, there should also be freeze protection, especially if you live in an area where it is extremely cold. The tankless water heater must also be made from premium materials so that it can operate safely. Energy Efficiency: Whether you purchase one that is electric or gas-powered, you have to pay attention to its energy efficiency rating. Ideally, it should consume minimal energy without compromising its heating performance. Warranty: It is better to choose one product that comes with an extensive warranty coverage. Pay attention to the warranty of the heat exchanger, parts, and labor, among other things. This will provide you with peace of mind knowing that the product is covered by the manufacturer against defects and problems in craftsmanship. Reviews: If you are having difficulty deciding which one to buy, you have to rely on the feedbacks and real-life experiences of other people. Go online and look for reviews that will make it easier for you to weigh the pros and cons of the options that you have. Now that you are done reading this post, I hope that you can easily decide which is the best tankless water heater that is suitable for your needs. At the end of the day, the decision does not rely on me. Your personal needs and preferences will be the deciding factors. Just be sure to take your time and be responsible to differentiate the options so that you can reach the right decision. An electric model is ideal for a smaller home and if your budget is limited. 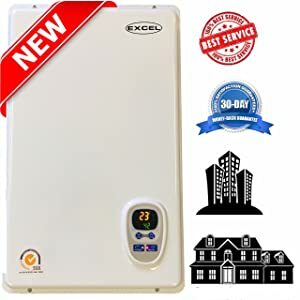 On the other hand, if you do not mind spending for a more expensive product and if you have extensive heating needs for a large household, a gas-powered tankless water heater will be the better option.